I felt the need to treat myself to a blush, and true to my fashion I went straight to Mac. Only owning one blush from them before, I had all the colours to choose from. This pretty muted coral-pink caught my eye immediately. Again, this is a limited edition colour, so grab if your Mac store has any left in stock. Also this will probably appear again in the future, and is available on other outlets online - but beware of fakes. Royal Sunset is a perfect name. When I think of sunsets I think of gorgeous coral and pink hues - And this is exactly what this little pot of blush is. I utterly adore this, and it's been going around with me everywhere. I'm usually the one to pop a wash of pink on to my cheeks, so it was nice to get a blush with a coral kick to it. It gives a lovely glow to my skin, and is easily buildable. It looks lovely on my pale complexion, and I believe it would on tanned tones too. I can't work out if this would look ashy on dark skin tones, so this is one to try before you buy. Once I've blushed this pastel hue over my cheeks it doesn't budge for hours. Doing split shifts as a waitress means I don't have time to redo my makeup, and this stays put from 12 noon to 11pm. An absolute winner from Mac. 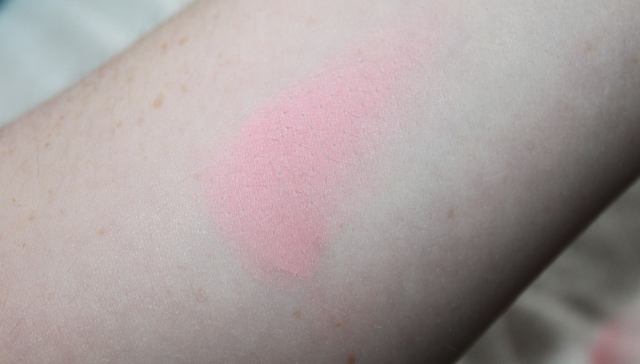 As you can see from the swatch below, it's a very light pastely pink, and swatches more pink that the coral it looks in the pan. That shade is gorgeous. It's the perfect pink, at least I think so.